THE SUCCESS that has attended the expiriments of the young Brazilian, M. Santo-Dumont, in scientific ballooning in France has been responsible for a marked impetus in this country in the fascinating and daring sport of flying. The probability is, however, that the final solution for successfully navigating the air will be accomplished by two American inventors combining their brains and energies toward perfecting a flying machine that will do what scores of men have been working to accomplish for many years. Gustave Whitehead, of Bridgeport, and W. D. Custead, of Waco, Texas, have co-operated and are now working on a flying machine which is expected to revolutionize the world of aeronautics. Accompanying this article are pictures of both the Custead and Whitehead flying machines. Mr. Whitehead is employed at the Wilmot & Hobbs works as night watchman and during about half the time that is allotted to most men to sleep he is working on his flying machine. Some weeks ago Mr. Whitehead took his machine out beyond Fairfield in a large field and tried it. There was no doubt of its being able to fly but at that time the inventor did not feel like risking himself in it for a trial. Tuesday night, however, of the last week, Mr. Whitehead, Andrew Cellie and James Dickie, his two partners in the flying machine, and a representative of the Herald left the little shed on Pine street where the machine is housed and took it to a suitable spot beyond Fairfield where its inventor head planed to take his first flight. The start was made shortly after midnight in order not to attract attention. The wings or propellers were folded tightly to the sides of the body of the air ship. The two engines were carefully tried before starting out and the new aceteline generator was gone over a last time by Mr. Whitehead to see that it was in perfect order. There was only room for two in the machine. Whitehead and Cellie occupying the seats while James Dickie and the Herald representative followed on bicycles. The machine rolls along the ground on small wooden wheels, only a foot in diameter, and, owing to their being so small, the obstructions in the road made it rock from one side to the other in an alarming fashion at times when teh speed was fast. After reaching the Protestant Orphan asylum at the corner of Fairfield avenue and Ellsworth street there is a clear stretch of good macadam road and the flying automobile was sent spinning along the road at the rate of twenty miles an hour. For short distances from there on the speed was close to thirty miles, but as the road was not straight or level for any distance this rate of speed could not be maintained. There seems no doubt but that the machine, even with its present common board wheels of only a foot diameter, can reel off forty miles an hour, and not exert the engine to its fulest capacity. The location selected to fly the machine was back of Fairfield along the highway where there is a large field and few trees to avoid in flying the air ship. It was about 2 o'clock Wednesday morning when the great white wings of the air ship were spread out ready to leap through the air. Mr. Whitehead was excited and enthusiastic and his two partners were almost as bad. The light was not very strong and everything looked like a ghost. Whitehead spoke in whispers, although the reason for it was not apparent. But probably the very time selected for trying the machine was responsible for that. The Herald representative assisted when the opportunity offered, but a stranger about a flying machine is sadly out of place and absolutely in the way when it comes the hour to fly the ship. Ropes were attached to the ship so that she would not get away from her handlers. In the body of the machine were two bags of sand, each weighing 110 pounds, for ballast. Mr. Whitehead started the engine that propells teh machine along the ground on the four wooden wheels, while his two assistants clung to the safety ropes. The newspaper man kept well clear of the machine, partly to better watch the operations and partly not to get tangled up in the ropes and wings of the giant white bat. Slowly the machine started at first to run over the ground, but inside of a hundred yards the men who had hold of the ropes and Inventor Whitehead were running as fast as their legs would travel. Then Whitehead pulled open the throttle that starts the air propellers or wings and shut off the ground propelling engine. Almost instantly the bow of the machine lifted and she raised at an angle of about six degrees. The great wings were working beautifully. She looked for all the world like a great white goose raising from the feeding ground in the early morning dawn. The two men with the ropes were tumbling over the hummocks in the field, for it was not clear enough yet to avoid such obstructions readily, and Whitehead waved his hands enthusiastically and excitedly as he watched his invention rise in the air. He had set the dial so that the power would shut off automatically when it had made one revolution in order that the machine would not keep flying and smash itself against the trees at the other end of the field. When the power was shut off the air ship settled down as lightly on the ground as a bird and not a stitch was broken or a rod bent. The air ship was now taken back to the starting point. And now the real test was to be made. 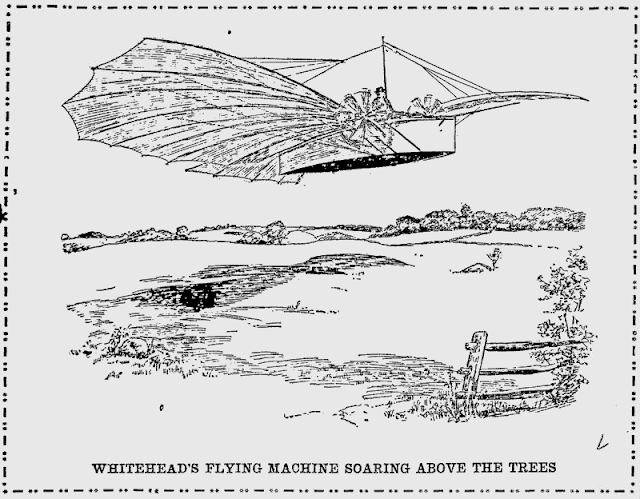 Whitehead had determined to fly in the machine himself. She had behaved so nicely that he felt that there would no longer be any trouble about his flying in the place of the 220 pounds of sand that was used for ballast on the first trip. The engines were carefully tested again and every joint and rod in the structure was carefully gone over and critically inspected. The bags of sand were taken out of the machine. By this time the light was good. Faint traces of the rising sun began to suggest themselves in the east. An early morning milkman stopped in the road to see what was going on. His horse nearly ran away when the big white wings flaped to see if they were all right. The nervous tension was growing at every clock tick and no one showed it more than Whitehead who still whispered at times but as the light grew stronger began to speak in his normal tone of voice. He stationed his two assistants behind the machine with instructions to hold on to the ropes and not let the machine get away. Then he took his position in the great bird. He opened the throttle of the ground propeller and shot along the green sod at a rapid rate. "I'm going to start the wings!" he yelled. "Hold her now." The two assistants held on the best they could but the ship shot up in the air almost like a kite. It was an exciting moment. "We can't hold her!" shrieked one of the rope men. "Let go, then!" shouted Whitehead back. They let go, and as they did so the machine darted up through the air like a bird released from a cage. Whitehead was greatly excited as his hands flew from one part of the machinery to another. The newspaper man and the two assistants stood still for a moment watching the air ship in amazement. Then they rushed down the slightly sloping grade after the air ship. She was flying now about fifty feet above the ground and made a noise very much like the "chung, chung, chung," of an elevator going down the shaft. Whitehead had grown calmer now and seemed to be enjoying the exhilaration of the novelty. He was headed straight for a clump of chestnut sprouts that grew on a high knoll. He was now about forty feet in the air and would have been high enough to escape the sprouts had they not been on a high ride. He saw the danger ahead and when within two hundred yards of the sprouts made several attempts to manipulate the machinery so he could steer around, but the ship kept steadily on her course, head on, for the trees. To strike them meant wrecking the air ship and very likely death or broken bones for the daring aeronaut. 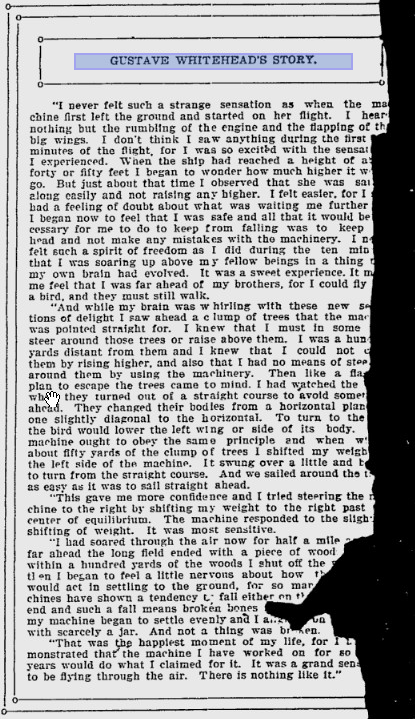 Here it was that Whitehead showed how to utilize a common sense principle which he had noticed the birds make use of thousands of times when he had been studying them in their flight for points to make his air ship a success. He simply shifted his weight more to one side than the other. This careened the ship to one side. She turned her nose away from the clump of sprouts when within fifty yards of them and took her course around them as prettily as a yacht on the sea avoids a var. The ability to control the air ship in this manner appeared to give Whitehead confidence, for he was seen to take time to look at the landscape about him. He looked back and waved his hand exclaiming: "I've got it at last!" He had now soared through the air for fully half a mile and as the field ended a short distance ahead the aeronaut shut off the power and prepared to light. He appeared to be a little fearful that the machine would dip ahead or tip back when the power was shut off but there was no sign of any such move on the part of the big bird. She settled down from a height of about fifty feet in two minutes after the propellers stopped. And she lighted on the ground on her four wooden wheels so lightly that Whitehead was not jarred in the least. How the inventor's face beamed with joy! His partners threw their arms around his neck and patted him on the back and asked him to describe his feelings while he was flying. "I told you it would be a success," was all he could say for some time. He was like a man who is exhausted after passing through a severe ordeal. And this had been a severe ordeal to him. For months, yes, years, he had been looking forward to this time, when he would fly like a bird through the air by means that he had studied out with his own brain. He was exhausted and he sat down on the green grass beside the fence and looked away where the sun's first rays of crimson were shooting above the gray creeping fog that nestled on the bosom of Long Island sound. "It's a funny sensation to fly." For half an hour the man who had demonstrated that he has a machine that can navigate the air talked of his ten minutes' experience in the airship. He was enthusiastic. Spoke almost like a child who has seen for the first time something new and is panting out of breath in an effort to tell it to its mother. But while Mr. Whitehead has demonstrated that his machine will fly he does not pretend that it can be made a commercial success. On the other hand Inventor Custead claims that his airship can be made a commercial success for it differs from Whitehead's in that it rises from the ground vertically while Whitehead's machine must have a running start like a goose before leaving the ground for the flight. Custead claims to have the most feasible form of air ship but he lacks a generator that is sufficiently light and will do the work required to propel the air ship. Whitehead, however, has the generator and by the combination of Custead's air ship and Whitehead's generator it is believed by the inventors that they will be able to perfect a machine that will ..... nearer to the point of success than any other machine thus far made. This new generator of Whitehead's promises great things if the claims by the inventor are fulfilled. The p..... is developed by a series of rapid ... explosions from calcium carbide .. the present time the spart exp... are not very rapid but Whitehead claims that he can produce 150 ... sions to teh minute if required .... gas thus generated is forced ... chamber where it comes .... with a chemical prepara... ingredients of which are kn... Whitehead. The contact... with the chemicals produces ... mous and even piston pre.... said that dynamite is no.... pared with this new powe... head has had the chemists .... chemical preparation and the.... at its power. The chemis... Chemical preparation a "q.. ture" but not one of them ... Whitehead has discovered ... valuable. The only demonstration ... generator's commercial val... in its use in the flying machine is no doubt that Whitehead's generator to propel teh fly... along the ground on its .... also for the power for the ....makes the propellers go w.... through the air. 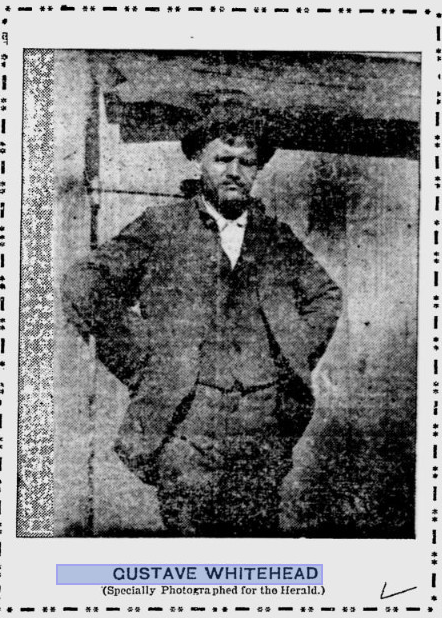 Source: The original article can be viewed at the Google Newspaper Archives, page 5 of the Bridgeport Sunday Herald, August 18, 1901.